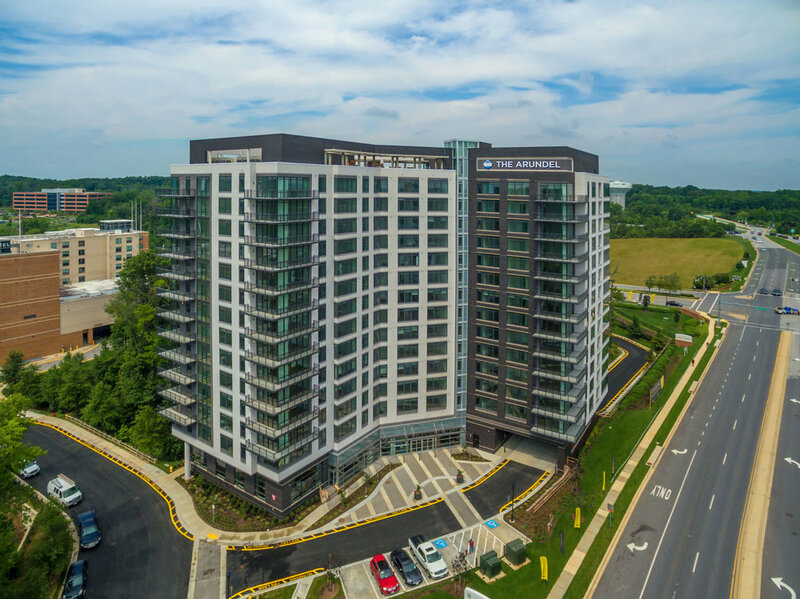 The Arundel is a 15-story apartment building located in Hanover, MD that wascompleted in 2017. The building framing consists of post-tensioned flat plate construction with reinforced concrete core walls providing resistance to wind and seismic loads. The building is founded on a system of auger cast piles. The unique feature of this project is that there is an existing storm water vault under the building that required an elegant solution; we designed a PT transfer mat using unbonded tendons supported by piles that allowed us to bridge over the storm concrete vaults. There are a series of four post-tensioned transfer girders spanning the loading dock at the north side of the building. These girders used bonded PT tendons that were stressed in 3 stages during construction.. To complete the project, we designed a bridge connecting the residential building to an existing garage at the fourth level.